Omnisphere is the most awesome synthesizer yet made, software or hardware. If you're serious about sound design you should get one! Omnisphere is Spectrasonics' new flagship virtual synthesizer instrument. It combines a powerful and flexible synthesis system with a huge sound library and a plethora of innovative features. The prototype caused quite a stir at this year's NAMM show, with renowned musicians hailing it as the most impressive synthesizer they'd ever heard. 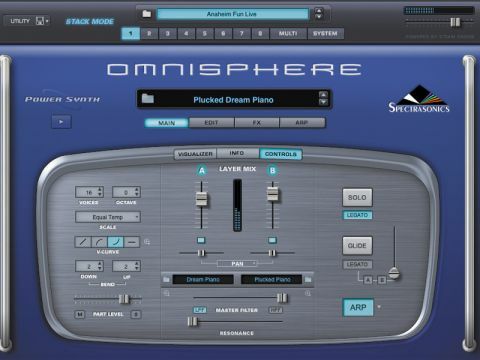 Omnisphere is an eight-part multitimbral instrument powered by what Spectrasonics describe as their 'new Steam Engine technology' – it can be considered as eight state-of-the-art synths rolled into one. Each of these parts has two layers and each layer has an oscillator that can be set either to Sample mode (which uses detailed samples as the sound source) or Synth mode (where the oscillator itself generates a wide range of waveforms). There's also a composite morphing technique, which morphs the harmonic characteristics of one instrument into another, eight independent arpeggiators, a huge 42GB sound library and a comprehensive effects system. But it doesn't stop there: alongside its regular multitimbral mode, Omnisphere also offers a Live Mode (where you can step through different sounds during a live performance) and Stack Mode (which allows the user to arrange and dovetail up to eight parts over different areas of the keyboard). Omnisphere comes with thousands of presets – just search the synth's browsers for specific instruments, timbres, categories, moods or genres. You can, for example, find a spacey piano sound by clicking Keyboards in a Category window, Pianos in a Type window and Ambient in a Genre window. There are three browsers: the Multi Browser, where you select Omnisphere's multitimbral presets; the Patch Browser, where you select dual layer patches for each part; and the Sound Source Browser, where you select the sampled sound sources for each layer. Omnisphere's interface contains progressive layers of 'zooming' to accommodate users, ranging from amateur musicians who want to quickly find cool sounds to expert synthesists and sound designers who want the maximum scope for their sonic manipulations. For the experts, Omnisphere offers a host of synthesis and control capabilities, including variable waveshaping DSP synthesis, granular synthesis, FM synthesis, polyphonic ring modulation, high-resolution streaming sample playback, and an innovative modulation routing system. It also integrates enhanced versions of Spectrasonics' award-winning Atmosphere sounds. There's even an excellent selection of free video tutorials to download. Omnisphere is a joy to use and one of the most awe-inspiring instruments we've ever come across. The three browsers are easy to navigate, although you can occasionally wonder which one you're in when you're first playing around with the synth. The sounds are fabulous, ranging from organic textures to charismatic arpeggiated tones, deep basses and soaring leads. The library also contains a range of unusual sounds including a burning piano (yes, literally a burning piano!) and all sorts of 'psychoacoustic' effects. The arpeggiator is amazing, especially if you load RMX grooves into it, while the Live Mode is a powerful feature in itself. Spectrasonics Omnisphere is a fantastic synth, capable of transforming anyone's Logic, Pro Tools or even GarageBand studio into a powerful music making machine. It's not the cheapest virtual instrument in the world but if you're serious about sound synthesis, you owe it to yourself to check it out!